Apple routinely releases updates to iTunes to fix common problems, and sometimes updating your iTunes to the latest edition can quickly fix iTunes won’t sync music issue. Click here to learn how to update iTunes. Sometimes the USB port goes bad and makes your iTunes won’t transfer music to iPhone. All you need to do is switching the USB cable from one port to another and see if it works. Also, try using a different USB cable. Some of your cables can malfunction and lead to sync errors. iTunes uses an authorization system to ensure only 5 computers can access your purchased music, videos and other media contents at any time. If your iPhone fails to sync with iTunes, the Sync button is greyed out and not available at all, you can simple re-authorize the computer with iTunes in the Store menu. iTunes won’t let you to sync music to iPhone is iCloud Music Library or iTunes Match is turned on. If that’s the case, you should disable iCloud Music Library and iTunes Match in your iPhone’s Settings > Music. After that, you can try syncing your iPhone with iTunes like normal. 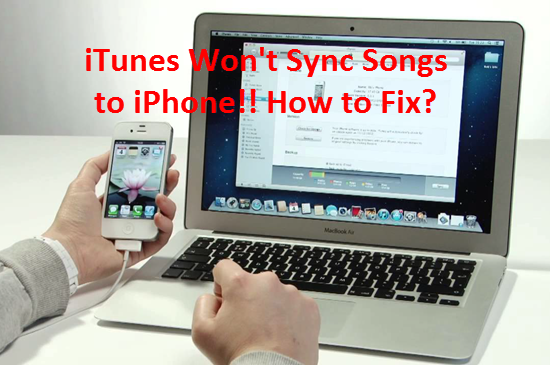 If the solutions above can’t solve “iTunes won’t sync songs to iPhone or iPod” problem, try an iTunes sync alternative – Jihosoft Phone Transfer. It is great tool that works like iTunes, allows you to transfer music from iTunes to iPhone/iPad/iPod without replacing any existed data on device. In addition, it can do what iTunes can’t and let you transfer iTunes music to Android like Samsung, HTC, LG, Sony, Moto, Nexus, Huawei, etc. without limits.